Discussion in 'Magazines' started by vogue28, Mar 21, 2019.
dfl-001 and Bertrando3 like this. I love her but I hate this style and also too much Photoshop. All hail the queen of camp! I would've liked this on principle alone, that it's such a stunning shot makes it even better. Plus it's historical in a sense that she's not wearing a wig! Truly a W-level portrait cover, and perhaps the strongest under the new EIC after Nicole Kidman. I'll get it despite all those eye-rolling Meghan coverlines. Speaking of, is Clare is still milking that hype? Crikey, give it a rest already. 333101 and magsaddict like this. No doubt Edward will be sure to monopolise headlines if the next issue of UK Vogue goes out on a limb to 'celebrate' age. 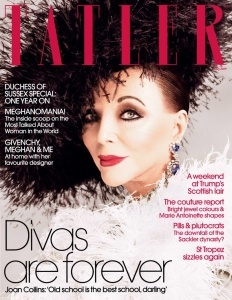 Here, we just have Joan Collins on the front of a magazine where it makes sense to see her, and her age isn't really an issue. LOVE her ahahaha such a dramatic actress and a gorgeous woman too !!! This cover is stunning !!! The layout too works wonderfully. love this! It really takes Tatler back to it's 80s campy heyday when it was all about big hair and Sloane Rangers. Afterall, i think the camp and tongue in cheek is partially what makes Tatler such a guilty pleasure. tigerrouge and Benn98 like this. ForTheImage, dfl-001, Miss Dalloway and 4 others like this. Oh that's a stunning, timeless cover! I keep forgetting how diverse Newton's clientele were. Over 80 and a cover star, love it! It could have been better, but i won't be too picky since Joan is always fun. Fabulous! Quintessential Joan and I am immediately sold. I remember commenting in the Cover Rumor Thread a while back that I was rooting for Enninful to give Joan the cover of British Vogue, delivering us a beautiful Meisel shoot in the process but Dennan beat him to the punch and I couldn’t be more thrilled with the outcome. What a wonderful surprise! Benn98, dodencebt and tigerrouge like this. lelaid, Bertrando3, ForTheImage and 1 other person like this. Ugh, having looked at the issue over the weekend I couldn't help but feel rather duped after there's only TWO photos of Joan Collins inside the issue (those above), and therefore I abruptly shoved it back on the shelf. What a total waste! Must admit that I was fully expectant of a 10+ page portfolio of Joan by Luc Braquet but coming back to this thread for a rant and taking another look at the cover, I know for a fact that I'll end up getting this. Too good. Given its recent revamp, I now greatly enjoy being a subscriber of this magazine, and if you can get a year for £19 or less, that's around £1.60 an issue. In terms of page count, it was never the thickest of titles - and never will be - but the content seems consistently glamorous. What Joan's edit may lack in pictures, it more than makes up with soundbites. It's one of those celebrity profiles where you actually come away learning something refeshing about the subject. She hated her Helmut Newton cover, Alexander McQueen's Sarah Burton refused to lend her a look for her OBE acceptance gala, she knew the Delevingne girls when they were younger and Cara's favourite phrase was 'Mine, mine, mine! ', and her takeaway from the Meghan/Thomas Markle scandal is that she likes Meghan's penmanship.